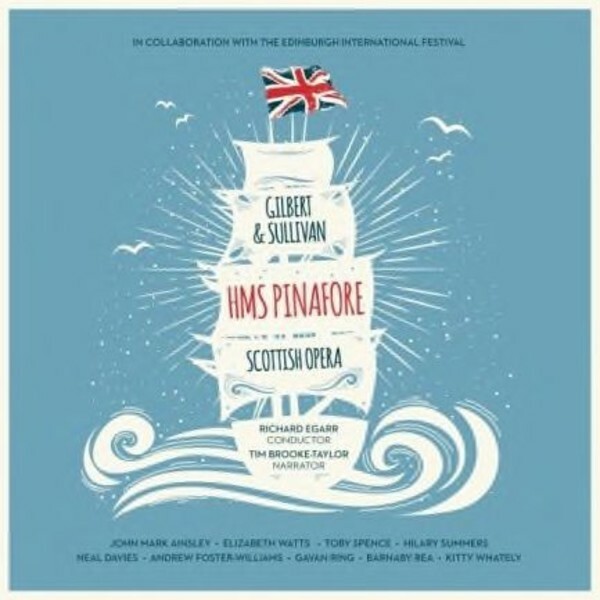 Richard Egarr conducts the Scottish Opera in Gilbert and Sullivan’s much-loved nautical comic opera: HMS Pinafore. Performed and recorded live at the 2015 Edinburgh International Festival to a sold out audience, the story unfolds with additional narration from comic actor and broadcaster Tim Brooke-Taylor. Heading up a cast that reads like a ‘who’s who’ of the opera world is John Mark Ainsley, Elizabeth Watts and Toby Spence. The well-crafted, yet light-hearted story unfolds on the HMS Pinafore as Josephine, the captain’s daughter, falls in love with a lowly sailor (Ralph Rackstraw) despite arrangements by her father to marry Sir Joseph Porter. Sir Joseph is a perfect caricature of Britain’s class system of the day – a pompous and splendidly incompetent man. Nevertheless, this likeable character decrees his liberal views and inadvertently encourages a couple in love to reject social conventions and elope. A tale of British silliness, filled with British humour, ends happily for all characters. Egarr applies his extensive knowledge of period performance practice to recreate the sound and style typical of the late nineteenth century, a first for a Gilbert and Sullivan recording. HMS Pinafore is rich in comic burlesque, sending up theatrical and operatic conventions and parodying the Italian opera of the day. The tongue-in-cheek writing is apparent from the opening chorus and the music is equally rich in comic pastiche and styles; ‘For he is an Englishman’ is one of the greatest master strokes. Climb aboard the HMS Pinafore for a hugely fun seafaring romp!